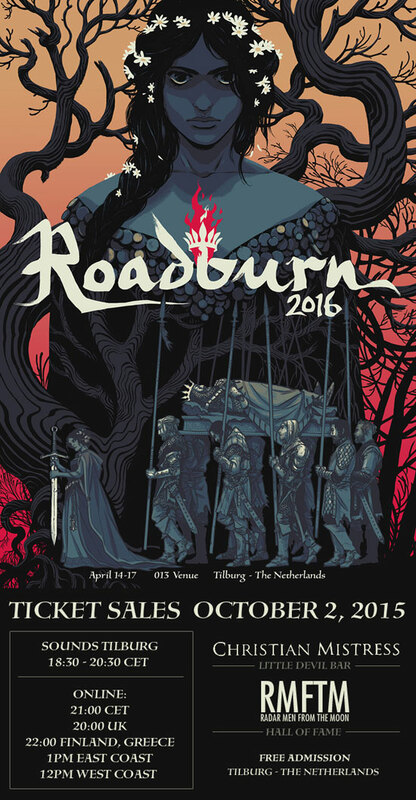 Home » News » Roadburn Festival 2016 Ticket Sales Start Fri Oct 2 @ 21:00 CET; Pre-Sales Party Announced! Walter & co are excited to announce that tickets for the 21st edition of Roadburn Festival, set for April 14 – 17 2016 at the 013 venue in Tilburg The Netherlands, will go on sale on Friday, October 2 2015. Set yourself a reminder and get ready to score your tickets at 21:00 CET. The majority of Roadburners live outside The Netherlands, which is why ticket pre-sales will start at 21:00 CET (20:00 UK time | 22:00 Finland, Greece | 1pm East Coast USA | 12pm West Coast USA). This should be convenient for most time zones. Apologies to their friends in Oceania who will have to wake up early (or just stay up late)! Roadburn are pleased to report that there will be NO price increase on weekend tickets this year – for the second year running! Three-day tickets will be available for 165 Euros (excl. service fees); four-day tickets will cost 185 Euros (excl. service fees). Sunday-only tickets will cost 39 Euros (excl. service fees). Please note that on October 2, one-day tickets will not be available for the Thursday, Friday or Saturday Roadburn dates, however, a limited number of day tickets will be on sale at a later date. Online buyers can order a maximum of four (4) tickets. For everyone in the Netherlands and Belgium: The pre-sales party has always been a popular event for nearby Roadburners to get their guaranteed tickets. With the building work at the 013 venue this year, they’re doing things a bit differently, but can still promise you a good night out alongside the chance to buy your Roadburn Festival 2016 tickets. This year, you will be able to buy your tickets from Sounds Tilburg from 18:30 – 20.30 CET – you will be able to purchase a maximum of four (4) paper tickets for Roadburn Festival 2016. Guaranteed! Sounds Tilburg is located at Nieuwlandstraat 33, 5038 SM, Tilburg (only about 8 minutes walk from Tilburg Central Station). Having your Roadburn ticket with you on October 2 will permit you entry to either Christian Mistress at Little Devil (Stationsstraat 27, 5038 EA, Tilburg), or Radar Men From The Moon at Hall of Fame (Burgemeester Brokxlaan 6, 5041 SB Tilburg). Two awesome, Roadburn-approved shows taking place on October 2 will be free to you upon showing your Roadburn ticket at the door – however, please note that once the maximum capacity of the venue is reached, you will be turned away – so don’t be late! Stationstraat is opposite from Tilburg Central Station, and goes along into Nieuwlandstraat – Little Devil and Sounds Tilburg are only a few minutes apart. In the Netherlands, tickets will be sold at Sounds Tilburg, Official Ticket Shops or call the ticket hotline: T 0900 300 12 50 (€ 0.45 per minute). Whether you’re buying your tickets in person or buying online – don’t miss out on your Roadburn Festival 2016 tickets. The countdown starts here!